The Dinosaur Dash Run for Education features 5K and 10K races for all ages, a 2K non-timed “Fun Run” and non-timed 15K and 50K bike tours. 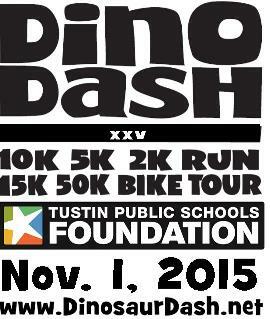 All proceeds benefit the Tustin Public Schools Foundation and all 28 TUSD schools. Spend time before or after the race at our Expo, which features our sponsors, schools, games, activities, and tasty treats. Bring your family and friends, and join us for a day of fitness and fun on Sunday, November 1, 2015.